RBearden56 wrote: Fo $50,000 you can do a lot better than the 162. The E-LSA are better equipped and more affordable. If you have good mechanical skills and willing to learn then LSRM and LSRI certs will save you a tone of money over the life of you aircraft present and future. I have seen a Lighting LS1 for $50,000 on Trade a Plane and it is beautiful. Better airframe, interior, and engine than any Cessna 162. Or look at Rotax powered aircraft, lighter than the continentals and dependable with a huge owner base and support. I bought my Allegro 2000 E-LSA with very good avionics and low hours and the lower cost of ownership made this a bargain. Good luck on you search and let us know what you get. This is all a matter of opinion, much of which I don't agree with. For instance, how is an E-LSA better equipped than an S-LSA? It's only better equipped if someone chose to add more equipment. As far as I am concerned, most S-LSA are over-equipped for VFR daytime only flight. The problem is that with some manufacturers , it is impossible to get LOAs for anything that is not installed on factory planes ( I.e Sportcruisers) - in that case it makes a lot of difference since going ELSA is the only way to install other equipment. Now with ELSAs you can also save a lot of money if you decided to add avionics yourself later on and you have prerequisite training as you can do that youserlf - with LSAs your only option is to either pay someone or take 2 weeks long , $4000 class .. I would be happy with an LSA equipped with needle, ball, and airspeed, engine instruments, comm radio, and transponder with ADS-B out. More than that is a waste of money and extra weight, IMHO. And I definitely would not want leather interior and other creature comforts in an LSA. But my main point is this is all opinion. To state emphatically that you can do better than a C162 for $50,000 is someone's opinion. Personally, I would prefer a C162 or RV12 to any plastic airplane. But, that's my opinion. That doesn't mean they are any better or worse. TimTaylor wrote: I would be happy with an LSA equipped with needle, ball, and airspeed, engine instruments, comm radio, and transponder with ADS-B out. More than that is a waste of money and extra weight, IMHO. As an aside, that’s how I thought I wanted my Sky Arrow equipped. Turns out the Dynon D10A that came with the package was cheaper than going with steam gauges, and almost certain lighter as well. But I also perceive many Light Sports as “glided lilies”. THREE screens? REALLY? But who am I to judge, and the market seems to favor lots of glass. As a further aside, I use my steam airspeed and altimeter and physical inclinometer ball almost exclusively over the Dynon PFD. Basically, the Dynon is handy for computing TAS ad DA once I feed in the OAT, and is there in an emergency as an attitude indicator to help keep the dirty side down. But with conservative planning, I have not even come close to blundering into IMC in about 11 years and 530 hours. This panel can easily take me anywhere I want to go! Eddie, your panel is not much more that what I would want. My iPad Mini 4 running iFly GPS, now with AHRS, gives me most, but not all, that you get with the Dynon and Garmin. If I owned my own airplane, I would probably figure out a way to mount my Surface Pro 4 as the display. I just made tomorrow's flight using my Surface Pro 4 in tablet mode and iFly GPS simulation. The Surface Pro 4 would be a very viable display if it was mounted and plugged into a 12 volt source. Will someone please remind me how to post images? I don't know why I have such a difficult time doing that. Pretty easy here, some require a blood sacrifice. It only lets you do 3 pics so plan ahead... I'll post some examples later of how to post from online. 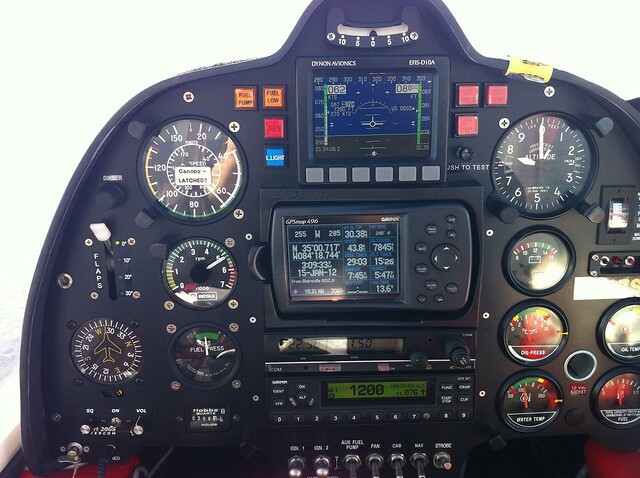 Great pics Tim, looks as good as any modern glass cockpit for thousands less. If only there was a way to extract serial data from those devices to drive an autopilot then you'd be on to something. ShawnM wrote: Great pics Tim, looks as good as any modern glass cockpit for thousands less. What’s even more ironic is that your average iPad is much more powerful ( as far as GPU/CPU is concerned) than anything you will find in the latest Dynons or Garmin. Autopilot? What's that? The iFly 740 can drive an autopilot. I'm not sure about the other iFly devices. Great, I could use a pop in Apple's stock. Then I could buy one of those new iPads. I'm sure the iFly can but I'm talking about a surface tablet or iPad driving an autopilot. There are already engine monitoring systems based on the Arduino/Atmel board that can bluetooth engine data to any tablet. This is your EMS. Couple this with Foreflight and its AHRS display with the moving map on a tablet and you have a full fledged glass cockpit for under $1000 for an experimental aircraft. I know many old timers who simply want steam gauges and a yoke...........yawn.